You'll be £9.00 closer to your next £10.00 credit when you purchase Tracing Your Great War Ancestors: The Somme. What's this? If you want to find out about an ancestor who served on the Somme during the First World War – during the Battle of the Somme in 1916 or at any time during the fighting in this sector of the Western Front – this book is the ideal guide. It provides practical information and advice on how to conduct your research. It will help you to discover when and where your ancestors served and give you an insight into his experience of the war. It is also a fascinating introduction to researching the Great War as a whole. Simon Fowler outlines the course of the fighting on the Somme, introducing the many historical resources that you can use to explore the history for yourself. He identifies the key sources for family historians, including at The National Archives and Imperial War Museum and the many online sites that researchers can turn to. There is also advice on the literature, archives, museums and monuments that may help you to gain an insight into your ancestor's story. and many contemporary photos of places, museums, displays, and documents. If you are looking for a good primer in World War I research, especially the Western Front, this is for you. A very handy and informative guide by Simon Fowler, who is well known for his practical guides and advice in this area. 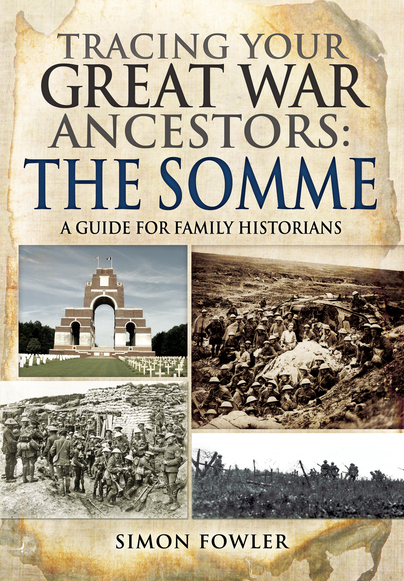 This book specifically deals with tracing family members who served on The Somme. An excellent guide, and one every researcher should have at their side for reference. For any researcher looking to focus their research on a particular area of the Western Front, this book is a good place to start. Overall a good book to use as appoint of reference and also one to guide any prospective researchers found on tours who are looking to find our more. Military genealogist and author Simon Fowler has come up trumps with this clear-intentioned and easily digestible introduction to tracing your British Army ancestors who fought on the Western Front in France and Flanders in the First World War... With jargon and records explained, and regular referral to key websites, this is another fantastically helpful hands-on guide for those starting down this path of research. This edition in the Tracing Your Great War Ancestors series gives researchers a comprehensive guide and is a very worthwhile read.